A version of this post was first published in April 2012. Ollie Couillaud is no longer behind the hobs at The Lawn Bistro, but early reports indicate new head chef Neil Cooper is helping the restaurant maintain its high standards. I’ll be revisiting in the near future – stay tuned for a more current review by following @scavgourmet on Twitter. For me, Wimbledon’s culinary renaissance began in earnest when The Lawn Bistro opened. Whatever the merits of the food at Claude Bosi’s revamped Fox and Grapes – and early reports were decidedly mixed – I can’t forgive him for so drastically changing a pub that didn’t have anything wrong with it. It’s now the sort of place where just popping in for a pint seems frowned upon, and dogs are almost certainly no longer welcome. If such a wholesale reinvention were necessary, the pub label should have been dropped entirely: it’s blatantly no longer anything of the sort. Like the old Fox and Grapes, Lydon’s restaurant was a relic of the old Wimbledon Village. Unlike the Fox and Grapes, however, its loss went largely unmourned. Lydon’s offered a certain nostalgic charm: nearly everything was wheeled out on trolleys – the fish of the day, desserts, cheeses – and the menu was from an era when the prawn cocktail represented the height of sophistication. It really was the restaurant that time forgot, the sort of place where you could imagine the Major from Fawlty Towers stumbling in half-cut to report on affairs at the local cricket club. But the novelty had largely worn off by the time the (sizeable) bill had arrived and you realised that the place’s only real merit was to allow people who remembered, possibly even fought in, World War I to have a smart-ish meal out. Exit Lydons, enter the Lawn Bistro and chef Ollie Couillaud. I first got wind of Couillaud when he took the helm at The Hansom Cab in Earl’s Court Road shortly after Piers Morgan bought it and tried to reinvent himself as the Kensington posh boys’ favourite publican. I knew the Cab well: the Oddbins where I worked was just around the corner and the since deceased Kensington Arms, where many of my friends had jobs, was one street over. The Cab’s transformation from non-descript-but-convenient dive into a place with gastronomic ambition intrigued me, not least because I was starting to get more serious about food writing at this point. It’s a shame I failed to visit it at the time because now it’s part of Marco Pierre-White’s empire of overpriced mediocrity, I almost certainly never will: I haven’t the remotest desire to pay the best part of £10 for a bowl of soup. But Couillaud’s name stuck in my mind. Chef Couillaud has quietly developed a bit of a reputation in foodie circles that dates back to his early days at Chez Bruce and La Trompette. The connection with the latter was immediately obvious on my first glance at The Lawn Bistro’s menu, which features a main of cod with vanilla vinaigrette. I remember a very similar dish the only time I dined at La Trompette: this slightly bizarre and overpowering flavour combination was the one bit of the evening I didn’t thoroughly enjoy. While my nineteen-year-old taste buds weren’t perhaps as adventurous as they are now, I feel my opinion on fish-pudding hybrids is unlikely to have evolved too much. 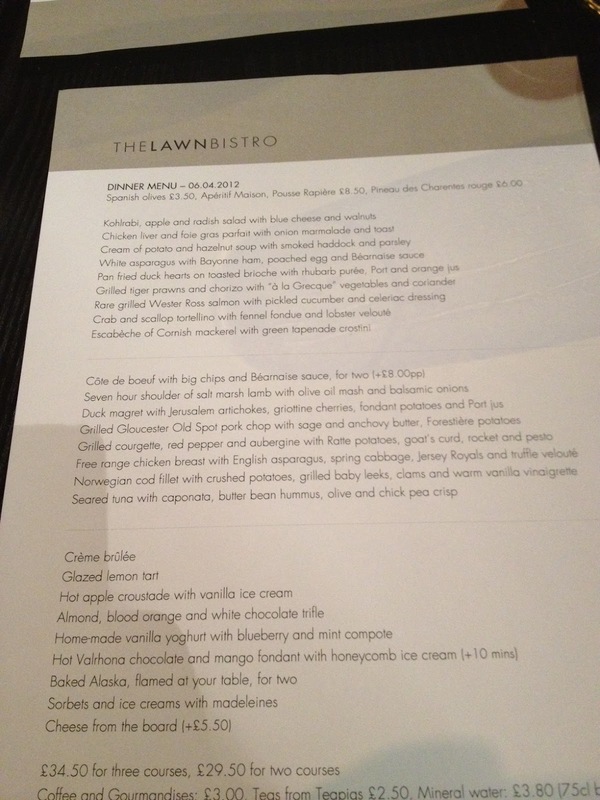 So I knew immediately what I wasn’t going to order, because I wanted very much to like The Lawn Bistro. I didn’t have to try very hard. 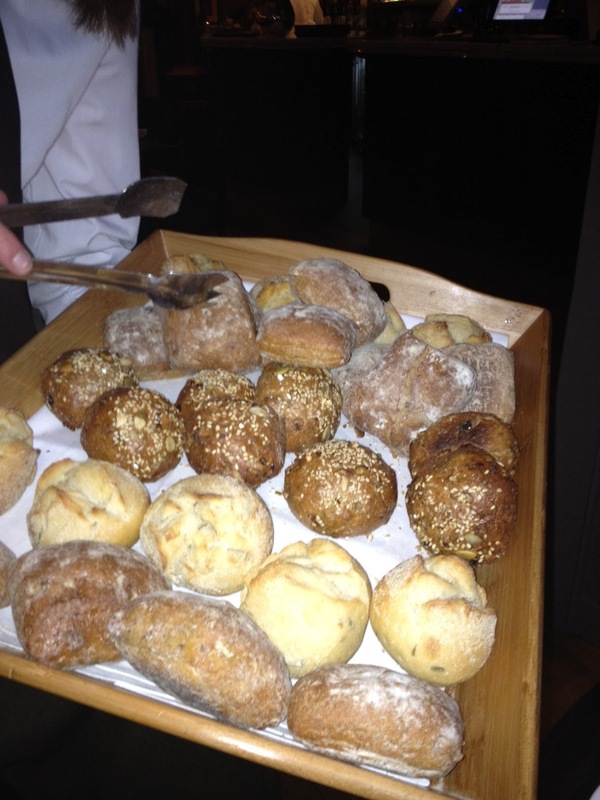 A smooth operation that impressed to varying degrees at every stage of the meal – even the homemade bread was more than an afterthought. The Lawn Bistro’s food isn’t of the razzle-dazzle or overly challenging variety, despite the presence of vanilla and cod on the same plate, but more about confident execution of quality ingredients and the odd little flourish. 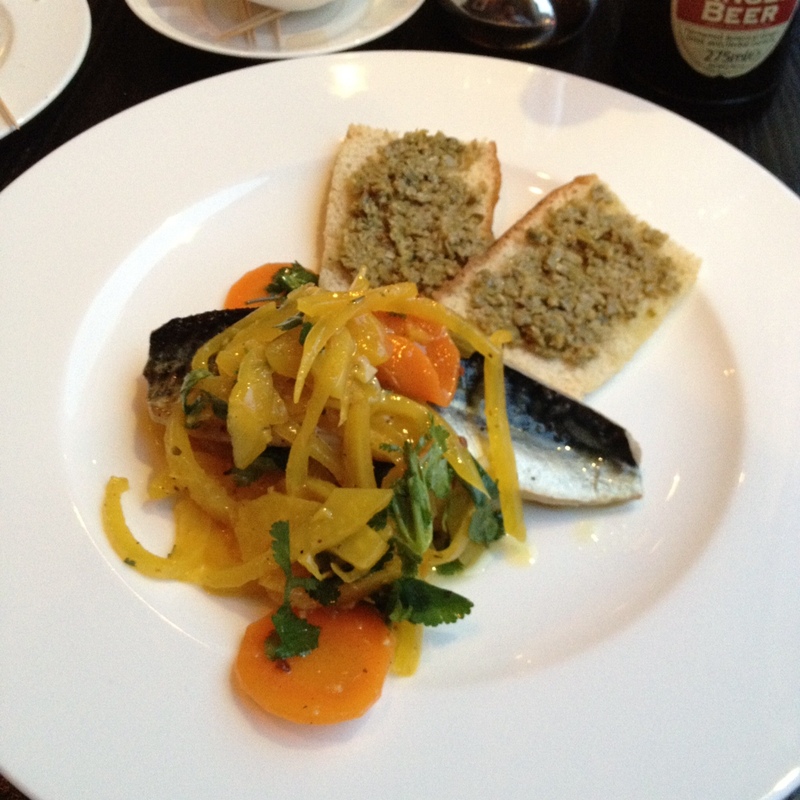 My starter of mackerel escabeche was the kind of gutsy fish dish I tend to rave about, the pickled flavours coming through strongest in the accompanying vegetables rather than overpowering the mackerel itself. I’m unsure about the finer aspects of preparing escabeche so don’t know if crisp skin is even possible, but if it is, it would have been an added plus. The accompanying green olive crostini offered a bit of saltiness and crunch and rounded out the plate amply. 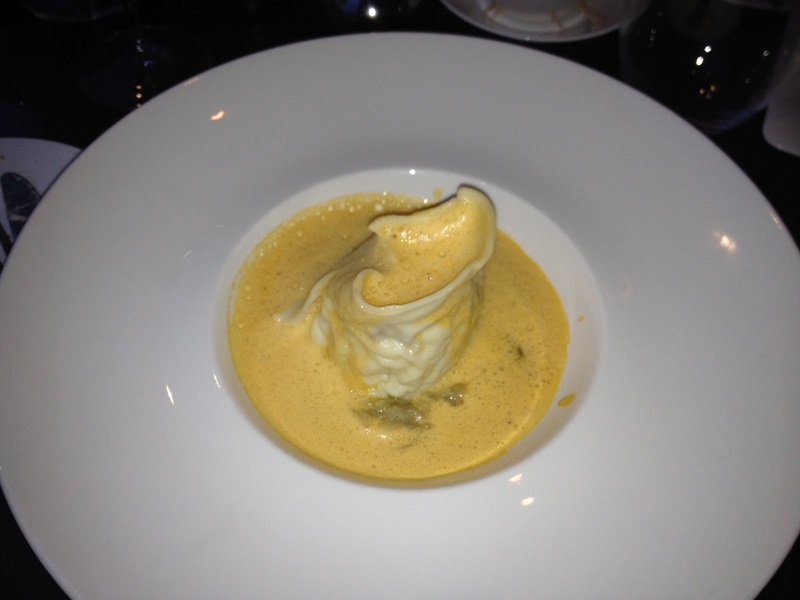 Al began with crab and scallop tortellino. Also close to faultless, it looked a bit like a fine sculpture when it arrived, bathed rather than swimming in the champagne veloute, the pasta not too soft, and the delicate flavours of the fish melding together nicely with the subtly sweet fennel. Mains were of a similarly high quality. Al didn’t rave about her seared tuna with caponata, which I put down to previous holidays in Sicily and also, cue smug face, my own homemade version of the stuff. 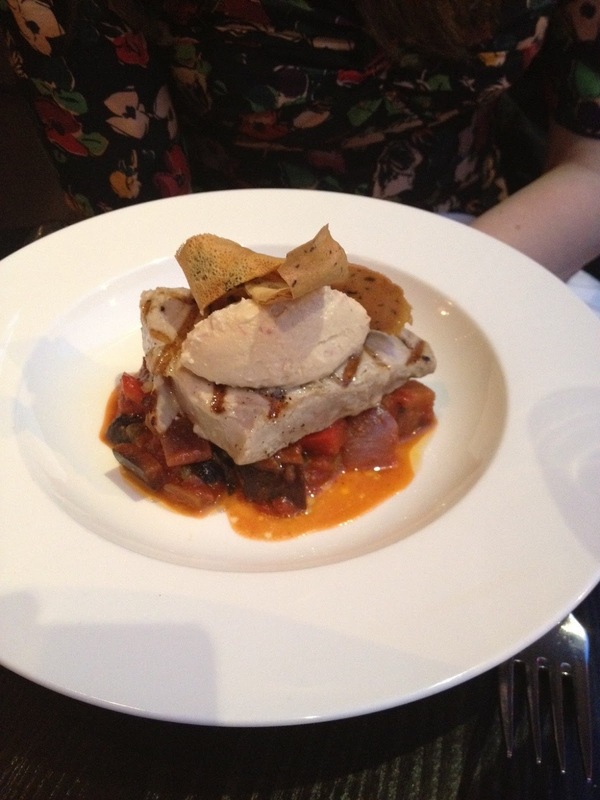 Though it might have underwhelmed her, it was in fact very good. It is staggering how often tuna ordered rare arrives looking like something ready to be pureed and turned into cat food. This, on the other hand, was the real deal: undercooked to perfection and accompanied by a caponata that was much better than just competent. Chunky, and with the vegetables cooked al dente in a way that only really good chefs can pull off, it was authentic rather than refined and wouldn’t have been out of place in San Vito lo Capo. The accompanying broad bean hummus grabbed me as simple yet a bit special, and a clever nod to Sicily’s North African and Arab influences. My duck magret was the standout savoury dish of the meal, everything about it reeking of perfection: the duck was beautifully pink, the fondant potatoes classically crisp on the outside and smooth inside, and the Jerusalem artichokes turned into an earthily sweet puree. Cherries brought the fruit punch needed to cut through the richness of the duck breast, while the port jus bound everything together and added an extra layer of richness just in case I forgot what a wonderfully indulgent plate of food this was. 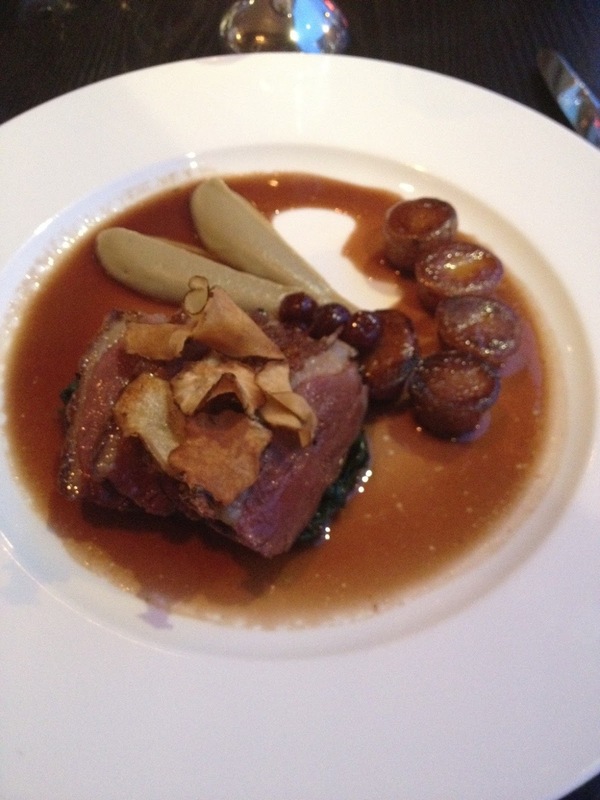 But if I thought my meal had peaked with the excellent duck main I was wrong. 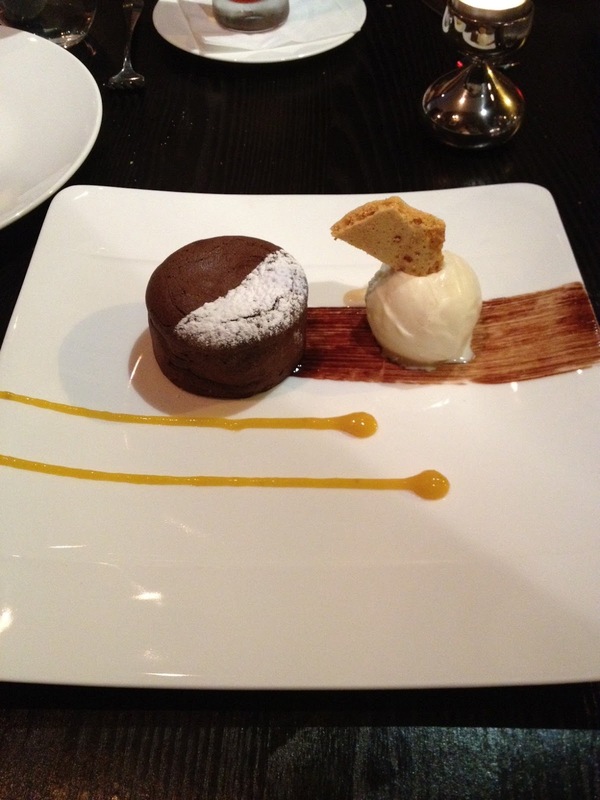 My mango-filled chocolate fondant with honeycomb ice cream was simply epic, a real technical masterpiece. A little cakey on the outside and stupendously gooey inside, the mango lightened the weight of the chocolate, the cooling honeycomb ice cream cut through its intensity, and the sweetness of both countered the bitter cocoa flavours with aplomb. It was also a beautiful sight to behold – the kitchen employed the increasingly widespread paintbrush technique first brought to my attention by Wylie Dufresne a year or so ago on Masterchef. While it must give every kitchen porter nightmares (it doesn’t willingly budge from the plate), it’s incredibly easy on the eye and, thankfully, I’m not doing the washing-up. Any complaints? I would have liked more of the little wafery things that accompanied the ice cream: not just for show, they were absolutely delicious. 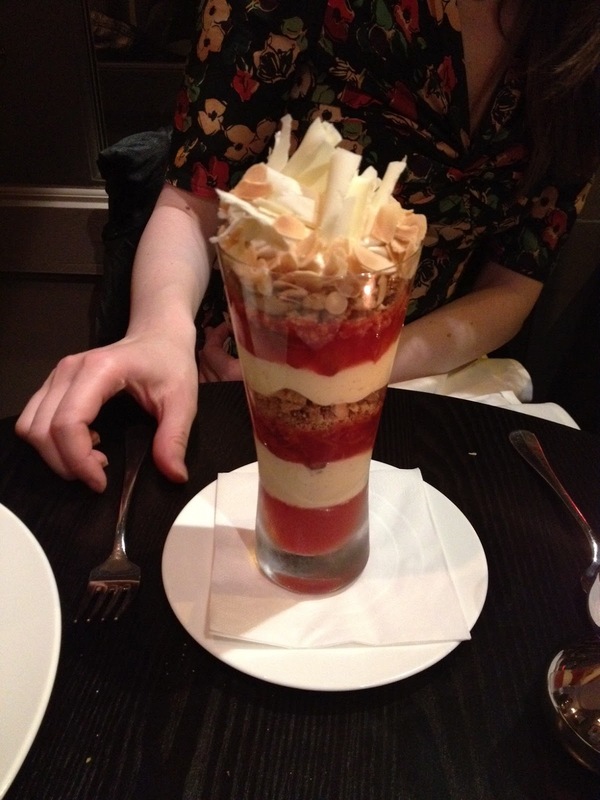 Al’s trifle also comes highly recommended. Consisting of shavings of white chocolate, seasonal blood oranges, a proper grown-up sized splash of booze, and a bit of texture from some almond, I can’t think of many pudding fanciers who wouldn’t be severely tempted by it. Another stunning visual spectacle, it was comfort food with serious swag. 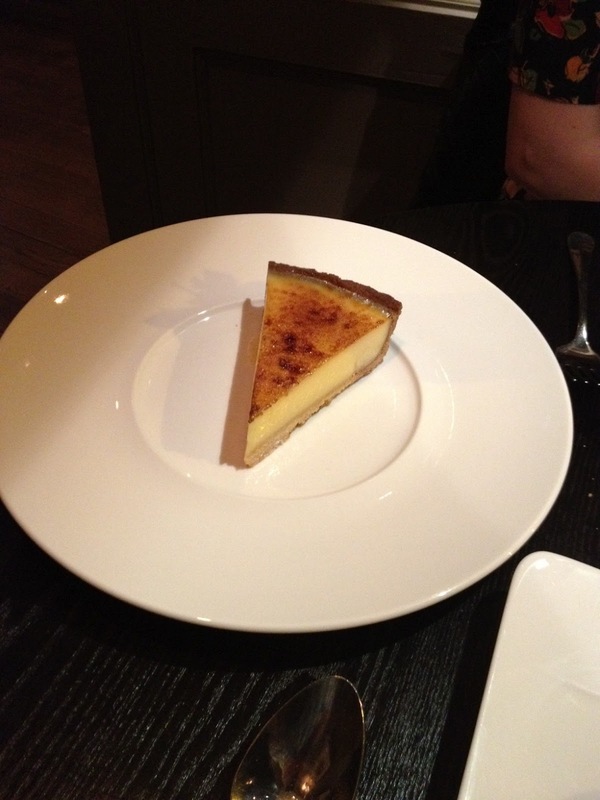 We were also treated us to a complementary taste of the Lawn Bistro’s glazed lemon tart (blogger freebie alert! ), which was a final master class in technique. Being a bit of a pleb when it comes to puddings, I was left gobsmacked as to how it managed to set and stay in one piece given the fantastic creaminess of the tart lemon custardy stuff inside, which was just zesty enough to cut through the rich buttery pasty without leaving you with too much of a sour face. If other parts of the meal revealed a well-travelled chef with a penchant for the more rustic aspects of Mediterranean cooking, this series of puddings showcased his more classical roots and French flair. Everything came to just under £100 – fairly priced if not exceptional value – including soft drinks, tea, and service but not including the extra sweet or the complimentary fizz that we approved of. Those operating on a stricter budget should bear in mind that we were largely on the wagon that night and the tab still hit the century mark. A good bottle from the well-thought out wine list would have increased the damage by around £25-30. Improving upon Lydon’s wasn’t exactly the kind of the task that would necessitate a culinary genius, but The Lawn Bistro has raised the bar several notches. Prior to its arrival, the gastronomic state of affairs in SW19 could have been described in a number of ways, none of them particularly positive or encouraging. I have heard old school toffs and yummy mummies alike defending the ‘reliable’ food on offer at Pizza Express and Carluccio’s, damning the local Indian and Chinese restaurants with similar praise, and pointing to The Lighthouse and Fire Stables as examples of quality dining options. Less tactful than most Wimbledon types, I would have called it absolutely shitting awful and I secretly suspect that all the people who offered these over charitable appraisals were, like me, mourning the loss of Kastoori in nearby Tooting and trying to get a table at Manson or the Harwood Arms in SW6. Now the ante has been well and truly up and locals need no longer try and hide their despair or sneakily venture to Putney or Fulham for a decent meal. The Lawn Bistro serves exactly the sort of food one used to seek out in South and West London’s posher postcodes with only occasional success. It sure did take a while, but Wimbledon has at long last got the sort of proper restaurant it deserves. Proving that good things do come (eventually) to those who wait, rumours are that The Lawn Bistro isn’t the only quality recent opening in town, so let’s hope that the area’s more established eateries finally up their game. They’ll have to if they want to compete with this kind of food.